Available for one week, from June 21 to June 28. On this week's edition of our Paragon Table, Heroes are requested to fullfill their Destiny. The Envoys of Gaia will access to a special Paragon Table of Legendary Qualities, with everything they need to finally find the weapons of their dreams. - Golden Weapon Conversion Scrolls. - Release of Sword of Revelations and Sword of the Damned. - Premium Enchantment Costume Weapon Cards. - Holy Water Restructuring Solutions and Costume Restructuring Solutions. A special edition of our AP and LP Hot Weekly Items with everything you need to work on your character and get perfect stats. Including forging scrolls, discounted fortification scrolls, randomizers, buffs, etc. Charming Buffs, exp bundles, inventory backpacks, sprites, and much more, to give your character a boost on that leveling! 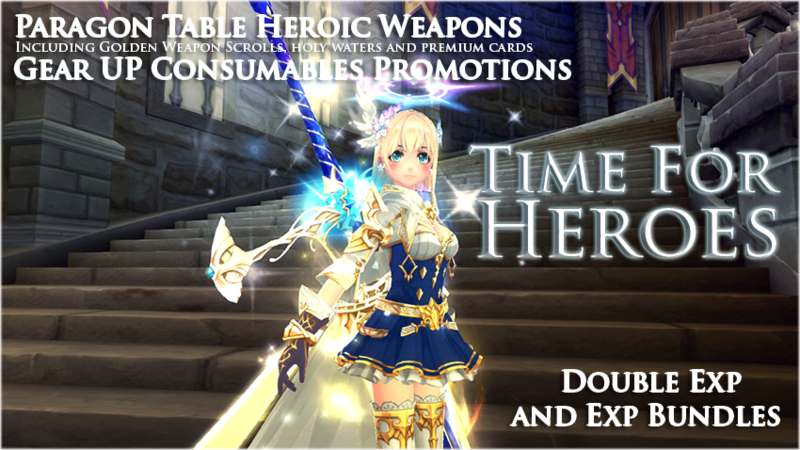 Promotions will be available for one week, from June 22 to June 29. Summer just started! And we will finish June and let you prepare for an amazing holidays with a special Double EXP Week, starting on June 22. Sanctuary of Eidolon Nightmare Trials: The brand new nightmare mode will be available in about two weeks from now to all SLV.1+ characters. The daily dungeon will give you the perfect opportunity to farm for the newest eidolons and work on their stories; leveling them up easy with new custom eidolon exp crystals, an opportunity to farm for Ring of Oaths and Eidolon Randomizers! But of course, it will also be a new level of challenge, and surviving the Angry Gods won't be an easy task. Eidolon 4* Stories: The brand new stats received for paired 4* Eidolons will arrive to the game together with the new SOET Nightmare, in about two weeks from now. Thanks for the great promos and para and the update on new nightmare just a quick question tho will nightmare SOET be the current path we have or will it be just the new unreleased one or both and we are able to choose what ever one suite us better ? For the moment, there will be only dark path in SOET Nightmare. Light path will be coming soon to the server, but I don't know how much time will take until the Nightmare Version is implemented. We will work in a x2 drop event in the future. At least not ignored. Thx.